This 1917 Kimball upright player piano has a striking appearance with elements of Mission style, including quartersawn fumed American Oak veneer and square-profile columns and lines. The instrument belongs to a Washington DC area family that wanted it restored. Evaluation by Historic Pianos determined that the sound quality was poor because of "tubby" and corroded overspun bass strings, rusted steel strings and pins, loose bridge pins, and because of cracks in the soundboard with significant separation of soundboard from ribs. The sides of the piano were also significantly separated from the main back frame. The action was poorly regulated and impaired by an unused retrofit "harpsichord" stop rail that was intended to lower metal snaps attached to fabric tabs between the hammer and strings, giving a hard metallic sound. The keyboard had an uneven feel and appearance due to improper regluing of loose ivories. And the player functioned poorly due to porous, old pneumatic cloth. The piano has a "three-quarters" plate design, where the pinblock face is completely exposed rather than covered by the perforated iron stringplate, and the iron fram begins only at the bottom edge of the pinblock. While the older 3/4 plate design is sometimes thought to provide less protection for the pinblock, the original #1 tuning pins had moderate, uniform tuning torque, suggesting that the pinblock was solid and in excellent shape for a 91-year old instrument. 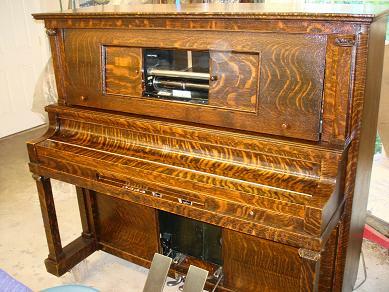 Restoration by Historic Pianos in 2008 began with disassembly of the player, action and keyboard, unstringing of the piano, and regluing of the separated sides to the main back frame. The soundboard was repaired and reglued to the ribs where separated, bridge pins were reset and bridges repaired, and the piano was restrung with new treble and bass strings using new #2 sized nickel-plated tuning pins. The bottom of the instrument supporting the pedals and player pump action was also found to be badly cracked, so it was removed and repaired. The loose and poorly-repaired ivories were repaired properly, replacing several keytops with matching ivories from other old instruments, and the keybed was leveled with new balance rail and front rail felt and paper punchings, restoring a uniform appearance and feel. The hammers were reshaped and the action and dampers fully regulated. The restored piano has a pleasing tone and plays smoothly and beautifully. The player was fully restored, including complete disassembly of the player stack and recovering the individual striker pneumatics and valve pouches. All other player components including pump pneumatics and reservoir, air motor and governor, tracking pneumatics, pedal and expression pneumatics, tracker bar and tubing, and roll transmission were repaired and restored, allowing the player to function well, with much easier pumping than before restoration. Several visible missing sections of veneer on the oak case were repaired, and the original crazed and slightly hazy finish appearance was significantly improved by building the existing finish with additional French Polish oil and shellac.